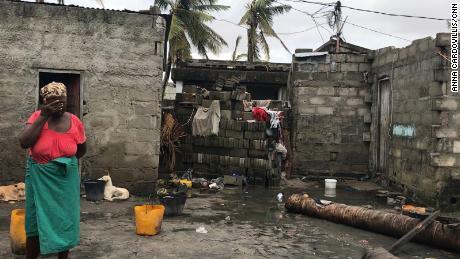 After speaking with families at a center for internally displaced people in the port city of Beira, the charity said it was concerned that the “urgent and long-term needs of children continue to grow,” following the cyclone. During Save the Children’s investigation, the agency asked children to draw their homes before and after the cyclone and to describe what they had witnessed. In their pictures, children drew devastating images of adults and children crying and people drowning in floodwaters. The charity used only the first names of the children and adults in its study. 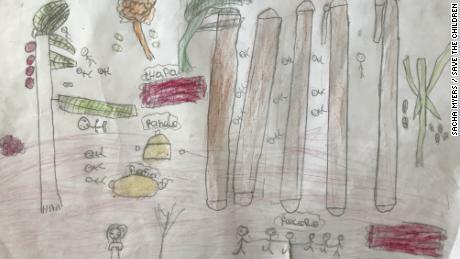 Ten-year-old Faizal’s drawings showed a stark difference of his home before and after the cyclone. He drew himself playing outside his colorful home before the cyclone, compared to scene afterwards — which showed a colorless picture, with children crying “mama” and a person appearing to be decapitated by a corrugated iron sheet. “Many children we have spoken to have seen their parents or siblings swept away by the floods or have witnessed their homes crumble around them,” Save the Children’s mental health and psychosocial support specialist in Mozambique, Maria Waade, said in a statement. 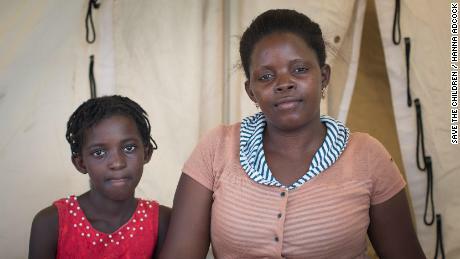 “One girl we met saw her mother for the last time as she was pushing her onto a roof for safety. “These stories are frighteningly common, and this consultation shows that beyond rebuilding homes and livelihoods, we also need to focus on making sure children and their families receive the mental health support they need to recover from these experiences,” she added. 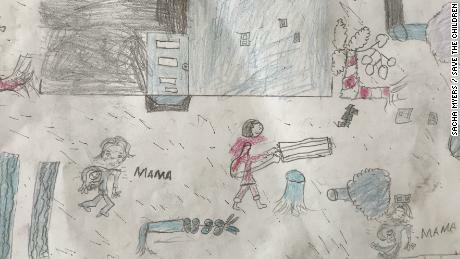 Eleven-year-old Ines drew a picture of dead people surrounded by broken trees. According to the charity, one mother says she’s noticed her children have started bedwetting since the cyclone and are more aggressive and clingy. Regina’s home was destroyed during the cyclone and she told Save the Children that she and her children escaped to a mosque when flooding began. She says they saw children and adults being swept away by floodwaters. “Before they behaved like children but now it looks like their behavior and their thoughts are of adults,” Regina said. Save the Children says close to one million children were affected by the cyclone and many are now living in tents, schools or temporary settlements with limited access to clean water or sanitation. In an attempt to help those affect, the charity says it’s began rolling out a child protection and psychosocial support team in Mozambique, as well as providing emergency shelter, food and healthcare to affected locals. Aid Agencies reported that following Cyclone Idai, 90% of the city of Beira had been ruined and that much of the city’s telecommunication infrastructure was destroyed. The flooding brought a rise in cases of the highly contagious disease cholera, which authorities have scrambled to contain. There was also an increased number of malaria infections, according to the International Federation of the Red Cross and Red Crescent Societies. Earlier in April, the World Health Organization reported that it estimates the total cost of medical relief operations in the country over the next three months could hit $40 million.